WordPress provides you with a built-in Post Editor that contains various options to perform formatting to your posts. Most of the formatting functions are similar to the other Word Processing Software and these can be found in Post Editor Toolbar. 1. 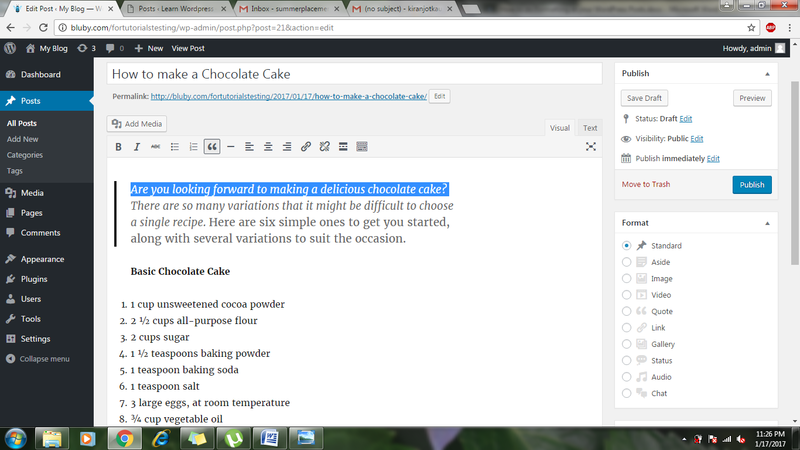 For start formatting your WordPress posts, go to Posts option present on your dashboard and select All Posts. You can also go to Add New if you want to create a new post instead of editing the existing ones. 2. There are several icons available in the WordPress post editor toolbar for different formatting options. 3. You will find an option to bold, italicize and strikethrough text in the first row of toolbar. You can use these options simply by selecting the text and clicking on the corresponding button. For instance, select the text and click on the bold button and your text will be bolded. 4. There are the icons for lists with numbers and bullets. You can select the text in your post and click on these buttons for creating a numbered or bulleted list. 5. There is an icon of quotation mark which is used for quoting a block. This can add an italicized and indentation style to the text you selected. 6. Next options are that of alignment. There are options to align your text to left, center and right. 7. There is an icon for insert more tag. This option will help you change how much text can be displayed in your blog with a link of read more. 8. There is an option distraction free mode and this will help you in writing in a full-screen mode without any distraction. You can exit by clicking exit fullscreen. 9. There is an option of Show/hide the Toolbar Toggle or kitchen sink which will give you another line of options for formatting. You will get options to add heading styles to your text, underline the text and set full alignment to the text. 10. You can change the colour of the selected text by using the icon for selecting the colour. 11. There are icons for pasting text. This will give an option for pasting from Microsoft Word or as a plain text. You can easily perform the formatting by simply hovering over the icons and you will see name and function of the icons.